G.W. Tornroos, Vancouver Sun, April 29, 1940, page 13, column 1. Henderson’s Greater Vancouver City Directory, 1917, page 807. Gunnar Wilhelm Tornroos was an engineer and equipment dealer. He lived at 1833 Comox Street in 1913 and 1914, and at 2047 Pendrell Street in 1917 and 1918. Gunnar Wilhelm Tornroos was born in Helsingfors, Finland, on June 9, 1883. His parents, Johan A. Tornroos and Aurora Wilhelmina Lindstrom, were born in Sweden. After Gunnar moved to Canada in 1902, he worked for the Canadian Pacific Railway’s engineering department in Toronto, Smiths Falls and Ottawa, Ontario. In 1910, he resigned from the C.P.R. and moved to Vancouver. He first appeared in the Vancouver directories in 1911. He was living at 603 Howe Street and working with B.C. Equipment Company. Henderson’s Greater Vancouver Directory, 1911, Part 2, page 1157. Henderson’s Greater Vancouver Directory, 1911, Part 1, page 505. Gunnar lived at the following addresses in Vancouver. On June 26, 1916, in Vancouver, Gunnar married Libbie Cleo Hall. She was born in Vancouver on September 3, 1892. Her parents were James Z. Hall (1863-1925) and Eliza Jane Greer (1866-1892). James Z. Hall was a realtor and investment broker. During the 1880s and 1890s he was in business with William Shannon (1843-1928) who lived at 1872 Nelson Street from 1910 to 1928. Gunnar belonged to the Shaughnessy Golf Club, the Vancouver Club and the Association of Professional Engineers. From 1924 to 1931, Gunnar was the vice-consul for Finland. In 1931 he became Finland’s consul. When the Soviet Union was attacking Finland in 1939, Gunnar’s consul duties increased significantly. 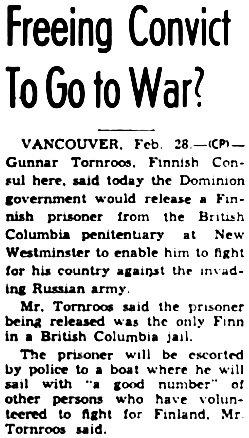 Some supporters went to Finland to defend against the Soviets, and there was talk of releasing a Finnish prisoner from the British Columbia Penitentiary to join the fight. The Ottawa Journal, February 29, 1940, page 13, column 7. On March 13, 1940, the Moscow Peace Treaty formally ended the dispute between Finland and the Soviet Union. Gunnar died in Vancouver on April 29, 1940. Nanaimo Daily News, April 29, 1940, page 3, column 4. In 1947, Libbie hired C.B.K. Van Norman to design a house for her at 1226 West 33rd Avenue. The administration of Gunnar’s estate led to a series of court applications. The Supreme Court of Canada resolved the issues in 1957: Crocker and Croquip Ltd. v. Tornroos and Tornroos,  SCR 151, 1957 CanLII 44 (SCC); https://www.canlii.org/en/ca/scc/doc/1957/1957canlii44/1957canlii44.html; reversing Tornroos et al. v. Crocker and Croquip Ltd., (1956), 3 DLR (2d) 9; 1956 CanLII 298 (BC CA); https://www.canlii.org/en/bc/bcca/doc/1956/1956canlii298/1956canlii298.html. Libbie died in Vancouver on March 8, 1974. She was buried in Forest Lawn Memorial Park in Burnaby, British Columbia. Gunnar and Libbie had the following children. Alfred Hall Tornroos was born in Vancouver on April 16, 1917. He was a student at the University of British Columbia in 1940-1941. University of British Columbia Calendar, 1940-1941, page 298 [extracts]; http://www.library.ubc.ca/archives/pdfs/calendars2/UBC_Calendar_1940_41.pdf. He later worked as a salesman and as a returning officer for the government of British Columbia. He died in Vancouver on February 17, 1979. He was buried in Forest Lawn Memorial Park in Burnaby, British Columbia. Talbot Gunnar Tornroos was born in Vancouver on November 2, 1920. In 1941-1942 he was a student at the University of British Columbia. University of British Columbia Calendar, 1941-1942, page 298 [extracts]; http://www.library.ubc.ca/archives/pdfs/calendars2/UBC_Calendar_1941_42.pdf. He worked as a building contractor. In 1947, he travelled to Seattle, Washington. He was planning to live permanently in the United States. His brother, Alfred, was travelling with him, but only as a temporary visitor. The National Archives at Washington, D.C.; Washington, D.C.; Manifests of Alien Arrivals in the Seattle, Washington District; NAI: 2953576; Record Group Title: Records of the Immigration and Naturalization Service, 1787 – 2004; Record Group Number: 85; Series Number: A4107; Roll Number: 039. Ancestry.com. U.S., Border Crossings from Canada to U.S., 1895-1960 [database on-line]. Lehi, UT, USA: Ancestry.com Operations, Inc., 2010. Name: Talbot Gunnar Tornroos; Gender: Male; Age: 27; Marital Status: Single; Record Type: Manifests; Birth Date: 2 Nov 1920; Birth Place: Vancouver, BC; Arrival date: 16 Nov 1947; Port of Arrival: Seattle, Washington, USA; Ship Name: Automobile; Residence Place: Vancouver, British Columbia, Canada. On March 26, 1960, in Siskiyou, California, he married Lillian May Roos. She was born in Powell River, British Columbia, on May 22, 1923. Ancestry.com. Canada, Voters Lists, 1935-1980 [database on-line]. Provo, UT, USA: Ancestry.com Operations, Inc., 2012. Name: Talbot Tornroos; Occupation: Lumberman; Year: 1953; Location: Vancouver, British Columbia, Canada; Electoral District: Vancouver-Quadra. Lillian died in Powell River on October 24, 1975. In 1979, when his brother Alfred died, Talbot was living at 1226 West 33rd Avenue in Vancouver. Vancouver Daily World, October 27, 1922, page 16, column 1. [Address should be 4126 Angus Avenue]. In 1945, he married Anne Louise McAlllister. She was born in Vancouver on October 12, 1924. Her parents were Neil and Janet McAllister. They were living in Vancouver in 2004. Lloyd died in Vancouver on January 2, 2015. Anne died in Vancouver on February 25, 2017. 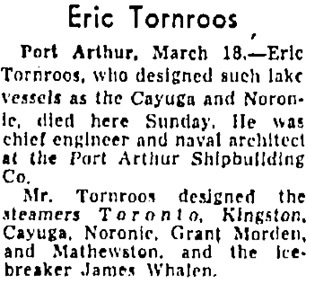 Gunnar’s brother, Eric Tornroos (sometimes Lars Eric Tornroos), was a naval engineer and ship architect. He died in Port Arthur, Ontario on March 17, 1957. Eric Tornroos, Toronto Globe and Mail, March 19, 1957; page 2, column 5. B.C. Equipment Company, Vancouver as it Was, July 31, 2015; https://vanasitwas.wordpress.com/2015/07/31/b-c-equipment-company/. “British Columbia Marriage Registrations, 1859-1932; 1937-1938,” database with images, FamilySearch (https://familysearch.org/ark:/61903/1:1:JDZL-XZJ : 11 March 2018), Gunnar Wilhelm Tornroos and Libby Cleoa Hall, 26 Jun 1916; citing Vancouver, British Columbia, Canada, British Columbia Archives film number B11379, Vital Statistics Agency, Victoria; FHL microfilm 1,983,707. 1921 Canada Census, Gunnar W Tornroos [indexed as Gunner W Tonner] Reference Number: RG 31; Folder Number: 19; Census Place: Point Grey (Municipality), Vancouver South, British Columbia; Page Number: 16. Ancestry.com. 1921 Census of Canada [database on-line]. Provo, UT, USA: Ancestry.com Operations Inc, 2013. “British Columbia Death Registrations, 1872-1986; 1992-1993”, database, FamilySearch (https://familysearch.org/ark:/61903/1:1:FLKG-H5L : 8 November 2017), Gunnar Wilhelm Tornroos, 1940. “Finnish Consul, G.W. 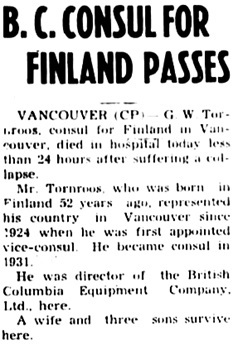 Tornroos, Dies Suddenly,” Vancouver Sun, April 29, 1940, page 13, column 1; https://news.google.com/newspapers?id=pTFlAAAAIBAJ&sjid=LokNAAAAIBAJ&pg=5196%2C4365629. “Death Claims G.E. Tornroos,” Vancouver Province, April 29, 1940, page 2. Gunnar Wilhelm Tornroos, death notice, Vancouver Province, April 30, 1940, page 15; Vancouver Sun, April 30, 1940, page 18, column 1; https://news.google.com/newspapers?id=pjFlAAAAIBAJ&sjid=LokNAAAAIBAJ&pg=1795%2C4530558. James Z. Hall, British Columbia from the Earliest Times to the Present, volume 3, edited by E. O. S. Scholefield, and Frederic William Howay; Vancouver, S.J. Clarke Publishing Company, 1914, pages 88-91; https://archive.org/stream/britishcolumbiaf00schouoft#page/88/mode/1up; https://archive.org/stream/britishcolumbiaf00schouoft#page/89/mode/1up; https://archive.org/stream/britishcolumbiaf00schouoft#page/91/mode/1up. “British Columbia Marriage Registrations, 1859-1932; 1937-1938,” database with images, FamilySearch (https://familysearch.org/ark:/61903/1:1:JDZ6-43S : 11 March 2018), James Z Hall and Eliza Jane Greer, 07 May 1889; citing , British Columbia, Canada, British Columbia Archives film number B11372, Vital Statistics Agency, Victoria; FHL microfilm 1,983,529. “Canada Census, 1891,” database, FamilySearch (https://familysearch.org/ark:/61903/1:1:MWKS-J8P : 3 August 2016), James L Hall, Vancouver City, New Westminster, British Columbia, Canada; Public Archives, Ottawa, Ontario; Library and Archives Canada film number 30953_148093. “Ontario Marriages, 1869-1927,” database with images, FamilySearch (https://familysearch.org/ark:/61903/1:1:FMKQ-J39 : 11 March 2018), James Hall and Jessie Columbia Greer, 01 Nov 1893; citing registration , Toronto, York, Ontario, Canada, Archives of Ontario, Toronto; FHL microfilm 1,870,704. “Canada Census, 1901,” database with images, FamilySearch (https://familysearch.org/ark:/61903/1:1:KHVN-1BP : 18 March 2018), James Hall, Burrard, British Columbia, Canada; citing p. 12, Library and Archives of Canada, Ottawa. “Recensement du Canada de 1911,” database, FamilySearch (https://familysearch.org/ark:/61903/1:1:27X1-913 : 16 March 2018), James Z Hall, 1911; citing Census, Vancouver Sub-Districts 19-50, British Columbia, Canada, Library and Archives of Canada, Ottawa, Ontario; FHL microfilm 2,417,662. “British Columbia Death Registrations, 1872-1986; 1992-1993”, database, FamilySearch (https://familysearch.org/ark:/61903/1:1:FL24-WMJ : 8 November 2017), James Z Hall, 1925. “British Columbia Marriage Registrations, 1859-1932; 1937-1938,” database with images, FamilySearch (https://familysearch.org/ark:/61903/1:1:JDZ6-4S1 : 11 March 2018), James Z Hall and Eliza Jane Greer, 07 May 1889; citing , British Columbia, Canada, British Columbia Archives film number B11372, Vital Statistics Agency, Victoria; FHL microfilm 1,983,529. “Canada Census, 1891,” database, FamilySearch (https://familysearch.org/ark:/61903/1:1:MWKS-J85 : 3 August 2016), Flora Jane Hall, Vancouver City, New Westminster, British Columbia, Canada; Public Archives, Ottawa, Ontario; Library and Archives Canada film number 30953_148093. Ancestry.com. British Columbia, Canada, Death Index, 1872-1990 [database on-line]. Provo, UT, USA: Ancestry.com Operations Inc, 2001. Name: Eliza Jane Hall; Gender: Female; Birth Year: abt 1866; Death Age: 26; Death Date: 8 Sep 1892; Death Location: Vancouver; Registration Number: 1892-09-112097; BCA Number: B13092; GSU Number: 1927120. “Canada Census, 1891,” database, FamilySearch (https://familysearch.org/ark:/61903/1:1:MWKS-J8R : 3 August 2016), Jessie A Greer, Vancouver City, New Westminster, British Columbia, Canada; Public Archives, Ottawa, Ontario; Library and Archives Canada film number 30953_148093. “Ontario Marriages, 1869-1927,” database with images, FamilySearch (https://familysearch.org/ark:/61903/1:1:FMKQ-J3Q : 11 March 2018), James Hall and Jessie Columbia Greer, 01 Nov 1893; citing registration , Toronto, York, Ontario, Canada, Archives of Ontario, Toronto; FHL microfilm 1,870,704. “Canada Census, 1901,” database with images, FamilySearch (https://familysearch.org/ark:/61903/1:1:KHVN-1B5 : 18 March 2018), Jessie Hall, Burrard, British Columbia, Canada; citing p. 12, Library and Archives of Canada, Ottawa. “Recensement du Canada de 1911,” database, FamilySearch (https://familysearch.org/ark:/61903/1:1:27X1-91Q : 16 March 2018), Jessie C Hall in entry for James Z Hall, 1911; citing Census, Vancouver Sub-Districts 19-50, British Columbia, Canada, Library and Archives of Canada, Ottawa, Ontario; FHL microfilm 2,417,662. “British Columbia Death Registrations, 1872-1986; 1992-1993”, database, FamilySearch (https://familysearch.org/ark:/61903/1:1:FLR7-DQV : 8 November 2017), Jessie Columbia Hall, 1949; http://search-collections.royalbcmuseum.bc.ca/Image/Genealogy/a34af94c-15ca-4a85-ba50-95c341751183. “British Columbia Birth Registrations, 1854-1903,” database with images, FamilySearch (https://familysearch.org/ark:/61903/1:1:JDZX-HMK : 11 March 2018), Libbie Cleo Hall, 03 Sep 1892; citing British Columbia Archives film number B13810, Vital Statistics Agency, Victoria; FHL microfilm 2,114,718. “Canada Census, 1901,” database with images, FamilySearch (https://familysearch.org/ark:/61903/1:1:KHVN-1BR : 18 March 2018), Libby Hall in household of Jessie Hall, Burrard, British Columbia, Canada; citing p. 12, Library and Archives of Canada, Ottawa. [listed as “son”]. “Recensement du Canada de 1911,” database, FamilySearch (https://familysearch.org/ark:/61903/1:1:27X1-917 : 16 March 2018), Gibbis C Hall in entry for James Z Hall, 1911; citing Census, Vancouver Sub-Districts 19-50, British Columbia, Canada, Library and Archives of Canada, Ottawa, Ontario; FHL microfilm 2,417,662. “British Columbia Marriage Registrations, 1859-1932; 1937-1938,” database with images, FamilySearch (https://familysearch.org/ark:/61903/1:1:JDZL-XZX : 11 March 2018), Gunnar Wilhelm Tornroos and Libby Cleoa Hall, 26 Jun 1916; citing Vancouver, British Columbia, Canada, British Columbia Archives film number B11379, Vital Statistics Agency, Victoria; FHL microfilm 1,983,707. 1921 Canada Census, Libby C. Tornroos [indexed as Libby C. Tonner] in household of Gunnar W Tornroos [indexed as Gunner W Tonner] Reference Number: RG 31; Folder Number: 19; Census Place: Point Grey (Municipality), Vancouver South, British Columbia; Page Number: 16. Ancestry.com. 1921 Census of Canada [database on-line]. Provo, UT, USA: Ancestry.com Operations Inc, 2013. Biographical Dictionary of Architects in Canada, 1800-1950, Charles Burwell Kerrens Van Norman (1907-1975); http://dictionaryofarchitectsincanada.org/node/82: WEST 33RD AVENUE, near Selkirk Street, residence for Mrs. Gunnar Tornroos, 1947 (R.A.I.C. Journal, xxiv, June 1947, 192, illus. ; C.H.G., xxvi, Feb. 1949, 26-27, illus. ; dwgs. at Vancouver City Archives). Social Register of Canada, first edition, 1958, page 77: Tornroos, Mrs. Gunnar W., 1226 W. 33rd Avenue [Vancouver]. “British Columbia Death Registrations, 1872-1986; 1992-1993”, database, FamilySearch (https://familysearch.org/ark:/61903/1:1:FLBK-SB2 : 8 November 2017), Libbie Cleo Tornroos, 1974; http://search-collections.royalbcmuseum.bc.ca/Image/Genealogy/f2b31572-8e4b-4c74-bcf0-34c8b8524940. 1921 Canada Census, Alfred H. Tornroos [indexed as Alfred H. Tonner] in household of Gunnar W Tornroos [indexed as Gunner W Tonner] Reference Number: RG 31; Folder Number: 19; Census Place: Point Grey (Municipality), Vancouver South, British Columbia; Page Number: 16. Ancestry.com. 1921 Census of Canada [database on-line]. Provo, UT, USA: Ancestry.com Operations Inc, 2013. “British Columbia Death Registrations, 1872-1986; 1992-1993”, database, FamilySearch (https://familysearch.org/ark:/61903/1:1:FL19-329 : 8 November 2017), Alfred Hall Tornroos, 1979; http://search-collections.royalbcmuseum.bc.ca/Image/Genealogy/0c97b629-b348-4f72-b2fd-e46666ed2aef. 1921 Canada Census, Talbot G. Tornroos [indexed as Talbot G. Tonner] in household of Gunnar W Tornroos [indexed as Gunner W Tonner] Reference Number: RG 31; Folder Number: 19; Census Place: Point Grey (Municipality), Vancouver South, British Columbia; Page Number: 16. Ancestry.com. 1921 Census of Canada [database on-line]. Provo, UT, USA: Ancestry.com Operations Inc, 2013. “New York, New York Passenger and Crew Lists, 1909, 1925-1957,” database with images, FamilySearch (https://familysearch.org/ark:/61903/1:1:24G3-FT6 : 15 March 2018), T G Tornroos, 1946; citing Immigration, New York City, New York, United States, NARA microfilm publication T715 (Washington, D.C.: National Archives and Records Administration, n.d.). Ancestry.com. California, Marriage Index, 1960-1985 [database on-line]. Provo, UT, USA: Ancestry.com Operations Inc, 2007. Original data: State of California. California Marriage Index, 1960-1985. Microfiche. Center for Health Statistics, California Department of Health Services, Sacramento, California. Name: Talbot G Tornroos; Gender: Male; Birth Year: abt 1921; Age: 39; Marriage Date: 26 Mar 1960; Marriage Place: Siskiyou, California, USA; Spouse Name: Lillian Ahola; Spouse Age: 36. “California Marriage Index, 1960-1985,” database, FamilySearch (https://familysearch.org/ark:/61903/1:1:V6KH-YKH : 27 November 2014), Talbot G Tornroos and Lillian Ahola, 26 Mar 1960; from “California, Marriage Index, 1960-1985,” database and images, Ancestry (http://www.ancestry.com : 2007); citing Siskiyou, California, Center of Health Statistics, California Department of Health Services, Sacramento. Ancestry.com. California, Marriage Index, 1960-1985 [database on-line]. Provo, UT, USA: Ancestry.com Operations Inc, 2007. Original data: State of California. California Marriage Index, 1960-1985. Microfiche. Center for Health Statistics, California Department of Health Services, Sacramento, California. 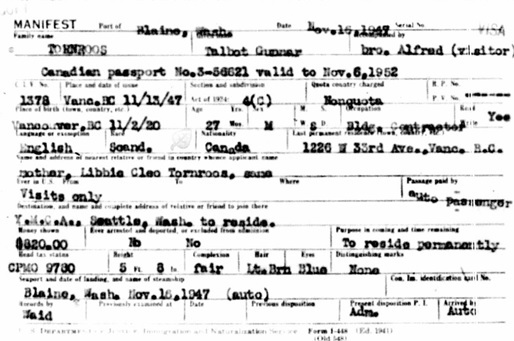 Name: Talbot G Tornroos; Gender: Male; Birth Year: abt 1921; Age: 39; Marriage Date: 26 Mar 1960; Marriage Place: Siskiyou, California, USA; Spouse Name: Lillian M Roos; Spouse Age: 36. “California Marriage Index, 1960-1985,” database, FamilySearch (https://familysearch.org/ark:/61903/1:1:V621-6HV : 27 November 2014), Talbot G Tornroos and Lillian M Roos, 26 Mar 1960; from “California, Marriage Index, 1960-1985,” database and images, Ancestry (http://www.ancestry.com : 2007); citing Siskiyou, California, Center of Health Statistics, California Department of Health Services, Sacramento. “British Columbia Death Registrations, 1872-1986; 1992-1993”, database, FamilySearch (https://familysearch.org/ark:/61903/1:1:FLBG-VQG : 8 November 2017), Lillian May Tornroos, 1975; http://search-collections.royalbcmuseum.bc.ca/Image/Genealogy/cfd38330-52f4-4fa9-90a1-6d063ea400bf. “New York Passenger Arrival Lists (Ellis Island), 1892-1924”, database with images, FamilySearch (https://familysearch.org/ark:/61903/1:1:JXGP-LJ9 : 30 January 2018), Lars Tornroos, 1908. “Ontario Marriages, 1869-1927,” database with images, FamilySearch (https://familysearch.org/ark:/61903/1:1:KSZ2-DX4 : 11 March 2018), Lars Erik Tornroos and Julia Hanna Stancombe, 18 May 1909; citing registration , London, Middlesex, Ontario, Canada, Archives of Ontario, Toronto; FHL microfilm 1,872,065. “Recensement du Canada de 1911,” database, FamilySearch (https://familysearch.org/ark:/61903/1:1:QV9P-WQGC : 16 March 2018), Lars E, 1911; citing Census, Thunder Bay and Rainy River Sub-Districts 1-30, Ontario, Canada, Library and Archives of Canada, Ottawa, Ontario; FHL microfilm 2,418,523. 1921 Canada Census, Eric Tornroos, Reference Number: RG 31; Folder Number: 82; Census Place: Port Arthur City – Third Ward, Port Arthur and Kenora, Ontario; Page Number: 4.Ancestry.com. 1921 Census of Canada [database on-line]. Provo, UT, USA: Ancestry.com Operations Inc, 2013.